Neighbor Deanne from Winield Street really likes Bernal Yoga at 908 Cortland (near Folsom). She doesn’t work at Bernal Yoga, or own the place — she says she just enjoys the yoga and the sense of community. 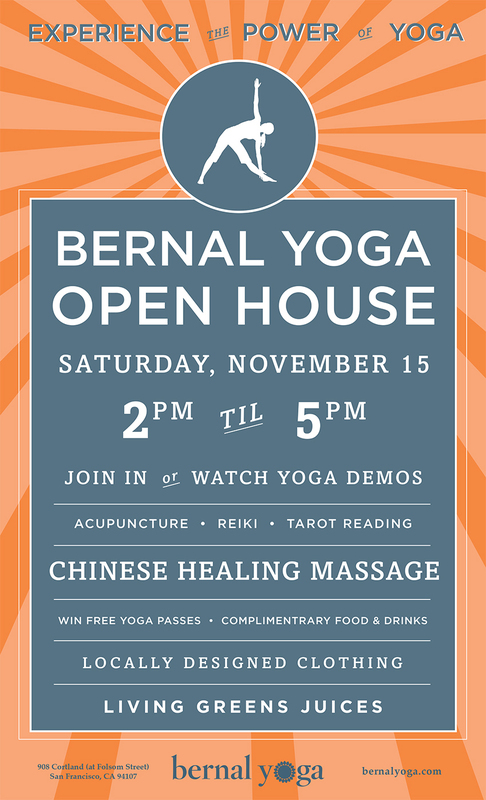 Bernal Yoga has been a part of the neighborhood for many, many moons, and this Saturday, Nov. 15 the studio will host an Open House for the yoga-curious from 2 to 5 pm. 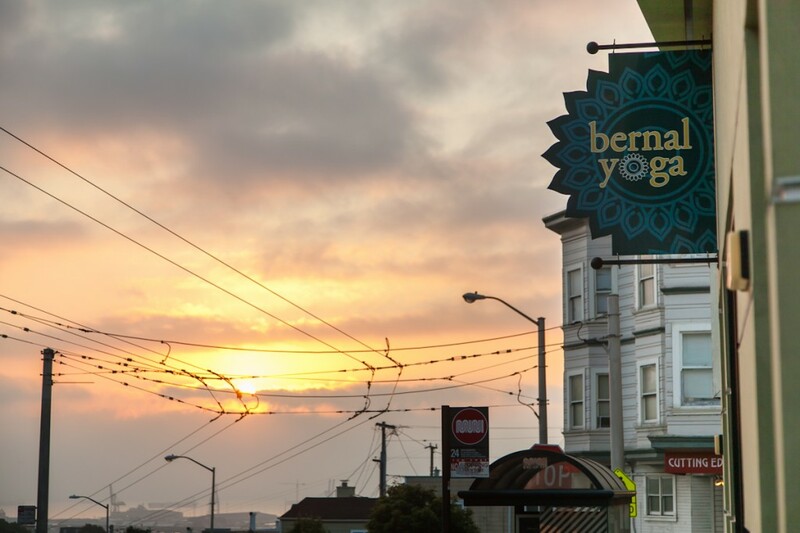 For those of you Bernal Yogis who do not often venture to the Eastern side of Cortland, you are missing out on a wonderful community-minded space we know as Bernal Yoga (“BY”). Or maybe you pass the studio all the time thinking that you’d love to try Yoga, but it seems too intimidating to get started. I used to fall into the latter category until I finally ventured into this studio several years ago to take an intro class. I couldn’t believe what a friendly and nurturing environment it was compared to other studios where I had tried Yoga in the past. For the record I am not an instructor, nor an employee – I’m simply a student, and from time to time you will find me volunteering at the BY front desk. BY is a very unique and charming studio that really embraces the first time student (and the inflexible) and has an amazing group of instructors that teach all classes for all levels – from newbies to the very experienced practitioner. There’s a wide variety of classes for all ages and abilities, and if you want to just lay around on props and de-stress from your day, check out one of the restorative classes. So now I am hooked – not just for the Yoga, but because of all the wonderful friends and neighbors I have met over the years at BY and for the community environment the studio fosters. I also love that the studio offers much more than Yoga – including lots of different styles of classes (there is now an acroyoga class! ), amazing workshops, pilates and bootcamps, but they also host the Bernal Yoga Literary Series, concerts, films, and other events to foster community and support local artists. If you haven’t checked out the studio, or just want to do something fun this Saturday and meet some new neighbors, BY is hosting a fabulous open house from 2-5pm. They will be doing yoga demos with the lovely Meghan, having a free raffle, free food, drinks and Living Greens juices, offering free acupuncture, Reiki and Chinese healing massage with local expert healer Man Chiu Tam, Tarot readings, and offering special discounts for Yoga classes. It’s going to be a fun event for Yogis and non-Yogis alike. So drop by to meet some new neighbors and experience the goodness of yoga and community! Bernal Yoga is the best!